All Hail The Queen and King of Mardi Gras! Congratulations to Ms. L’Vonne Anderson and Mr. Henry Dew on their recent coronation as this year’s Queen and King of Mardi Gras! 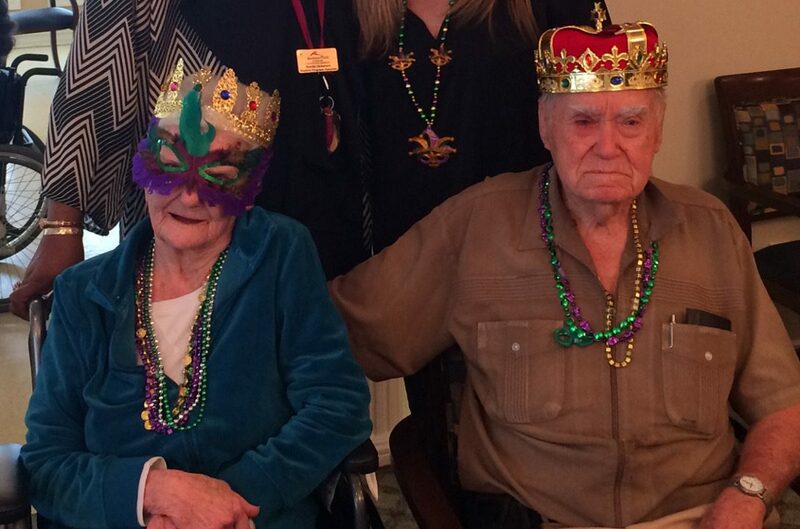 This year’s Mardi Gras Celebration was a smash hit at Savannah Court of Bastrop. Residents hosted a large turnout of friends, family, and other guests for a night of New Orleans fun and festivities. Attendees donned festive masks and colorful beaded necklaces while sharing an evening of warm camaraderie and lively conversation. It truly was a wonderful night of fun and friendship! A Tradition of Fun. A Tradition of Family. When we say we love to have fun at SLM, we really do mean it. Exciting activities and opportunities to socialize are important for happy people of all ages— and our residents remind us of that every day. That’s why we like to keep the calendar full of events that encourage family and friends to come in and participate in community activities. This allows families to stay better connected and involved in the lives of their loved ones, while also creating opportunities for new experiences and remembering old times with the people who care most. It’s just one more way that SLM goes the extra mile to provide the best living options for seniors. If you’re interested in joining your loved one for a special event at an SLM community, please visit the community evets page of their community. If you’re interested in exploring one of our senior living communities for yourself or a loved one, visit the community nearest you. Access all of these options at SLM.net.